While travelling around the UK, we got the opportunity to spend several weeks on the Isle of Wight. 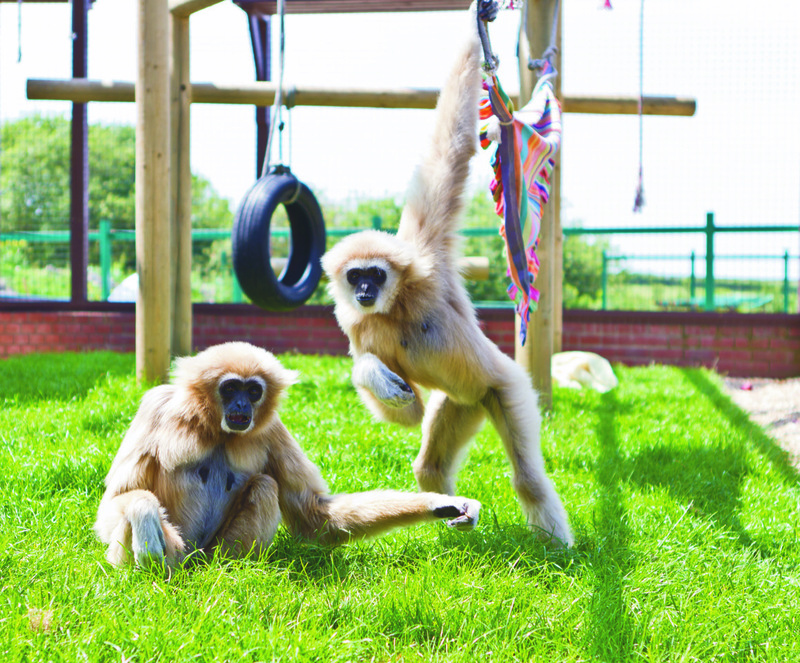 The island has many different attractions to suit all ages, but one of our favourites was Monkey Haven, a primate rescue centre which won the 2017 top small visitor attraction from Visit England. It's located only a few miles from the capital of the island - the town of Newport - making it a short 5-minute drive or you can catch a bus which stops just 200 yards away. Opened in 2010 by Don Walser and born from his passion and dedication to helping rescue primates and owls to give them a safe place to live and thrive, both he and his family and volunteers have created a unique attraction that looks after many different species giving each the individual attention that they need. Throughout the sanctuary, you'll find many different species of monkey, all with their own stories as to how they ended up finding a new home here. But it's not only monkeys that have been rescued and brought here - there are also birds of prey, meerkats and several different reptiles all being cared for by a dedicated team of staff and volunteers. While paying the entrance fee, the kids were each given a booklet that contained information to help them learn about some of the animals and provided activities for them to do as we walked around. The sanctuary is well laid out tidy and wheelchair friendly and as you walk around, you'll get to see all of the animals enjoying their spacious homes with different species of monkey that include Muller's Gibbons, Rhesus Macaques, White-Throated Capuchins, Siamang Gibbons, Marmosets and Lar Gibbons. 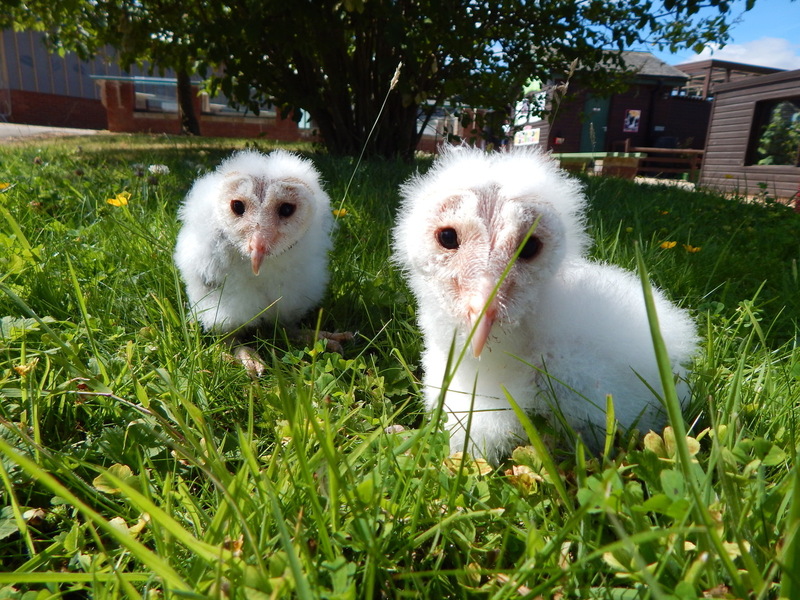 Some of the rescued and injured birds that they look after are Barn Owls, Kookaburras and Bengal Eagle Owls. As you walk around, two of the monkeys you'll come across are Cherry-Crowned Mangabeys - they've been brought together here each having their own unique stories. 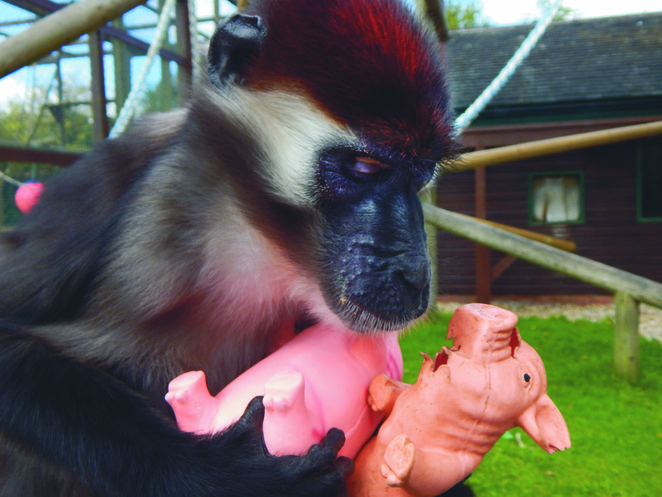 The female of the pair called Buna was born in Barcelona Zoo but as the lowest ranking member of her group, she was the last to get food at feeding times. 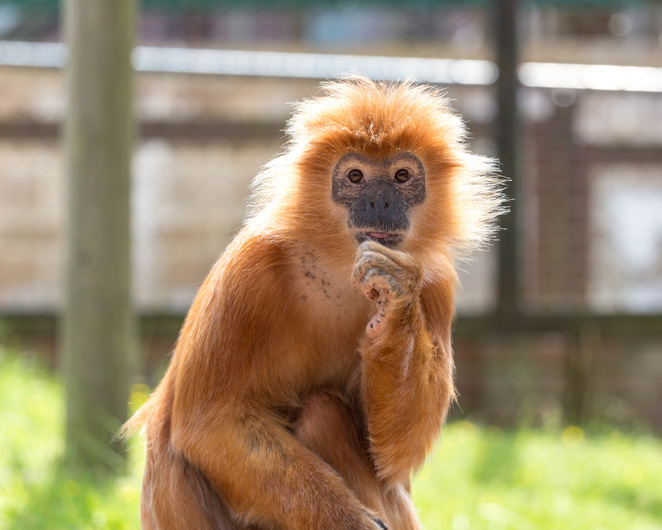 She always got picked on by the others in the group, so the zoo gave her to the animal rescue group AAP - this meant that she could have a better life and to become the partner to Djimmy. Djimmy was found on a road in Germany in 2007 and ended up in a cat and dog rescue shelter, spending almost seven years in isolation there, he started to show some abnormal behaviour. So the shelter made an appeal on TV hoping to find somewhere more suitable for him where he could have a better quality of life, fortunately, animal rescue group AAP stepped in and helped find him a new home, even giving him a toy pig as part of his rehabilitation, so now he always has to have one with him. 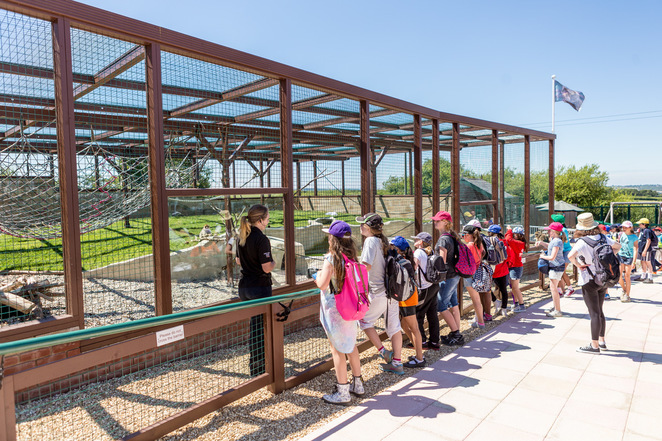 Throughout the day, they hold a series of talks where you get the chance to learn how the animals have ended up in the sanctuary these take place every 45 minutes each in a different area. The talks were interesting - we all enjoyed them and you can also ask the keeper questions. We visited on two separate days and got to see two different keepers giving talks on the same monkeys and enjoyed the different information that each was able to provide and their different presenting styles. During our visit, the Island was experiencing a bit of a heatwave, so they didn't bring out any of the owls to let us see them up close during the owl talk. Showing us that their priority is the welfare of the animals they care for and although it may have been disappointing for some, we thought that it was great to see how they prioritise the well-being of the animals and don't compromise this for a show. Even without being able to get close up to one of these majestic birds, the talk given was interesting and informative. As well as the animals, there are also playgrounds for the kids to run around in with a good size playground for over 5's up in the back, with nearby picnic tables and an Ice cream stand. Another playground for under 5's is near the cafe at the entrance, which also has a gift shop that you go through on the way out. Overall, we found this to be an outstanding visitor attraction that provided us with many hours of entertainment and education that our whole family enjoyed and if you remember to keep your ticket, you can also return for free with their 7-day return pass.